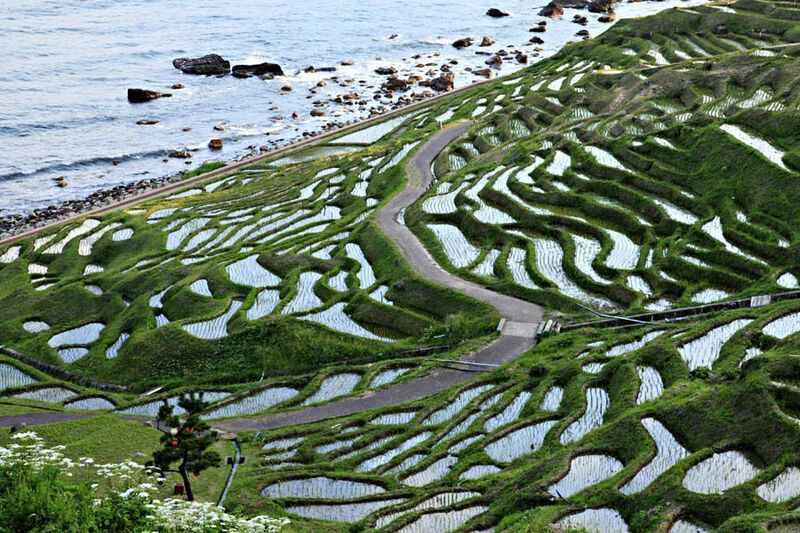 Shiroyone Senmaida (Rice Terrace of Shiroyone) is a rice terrace located in Wajima city, Ishikawa Prefecture. About 1004 small fields are arranged in a mesh pattern in the paddy field of about 4 hectares. The smallest field is very small, 0.2 square meters, and the machine can not enter. Therefore, all work such as rice planting and harvesting is done by traditional manual work. It is very cherished as a place where you can see the appearance of unchanged the way of agriculture of Japan. 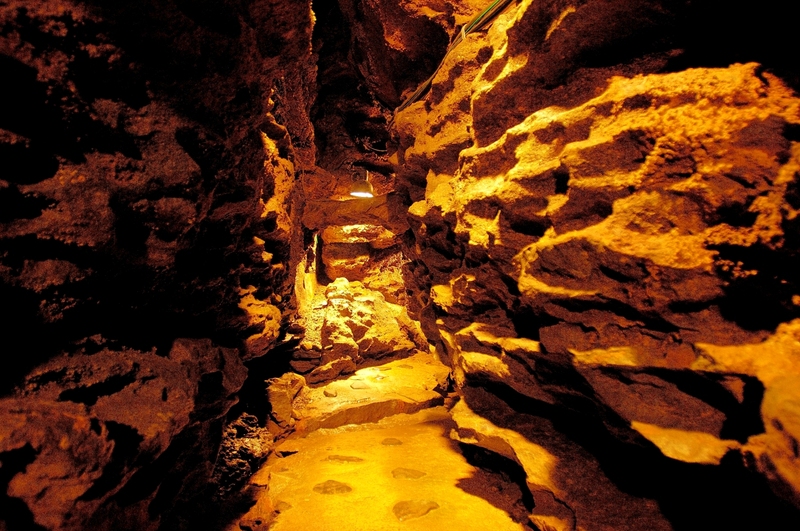 Shiroyone Senmaida has long been sung in folk songs, and is a place that has been loved and respected by locals as well. 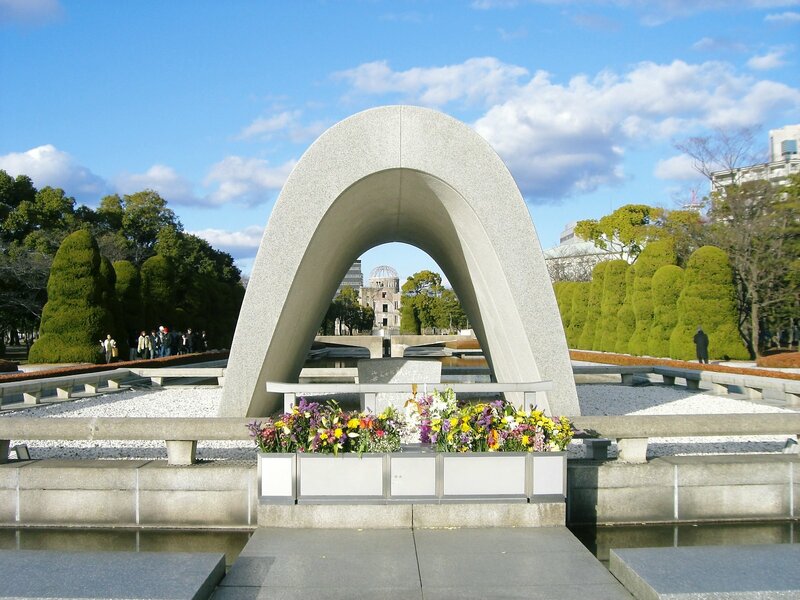 Today, it is very popular as a place where you can feel the atmosphere of the old days of Japan and has been drawing attention as a sight. 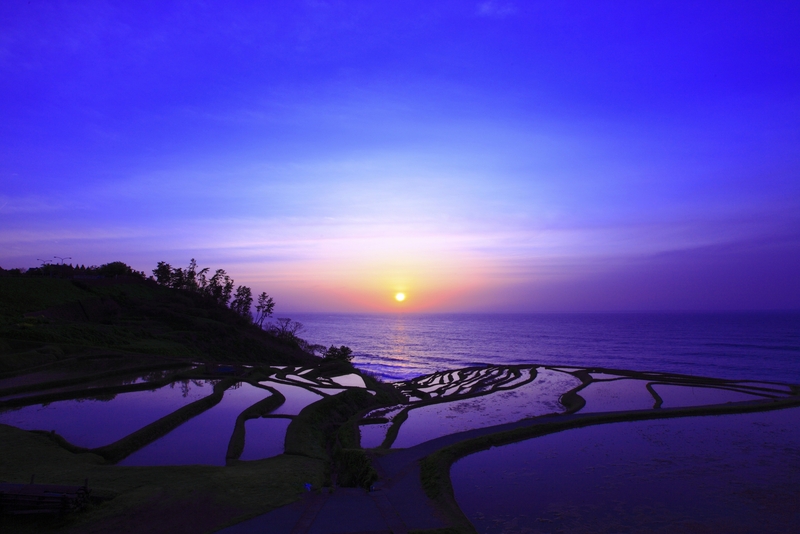 Shiroyone Senmaida was certified as Globally Important Agricultural Heritage Systems (GIAHS) in 2011, with recognition of the traditional agricultural culture of Noto Peninsula, the unchanged natural environment, the splendor of the landscape that overlaps many times. Shiroyone Senmaida is also called “original scenery of Japan” and is said to be a place where you can enjoy old-fashioned views. 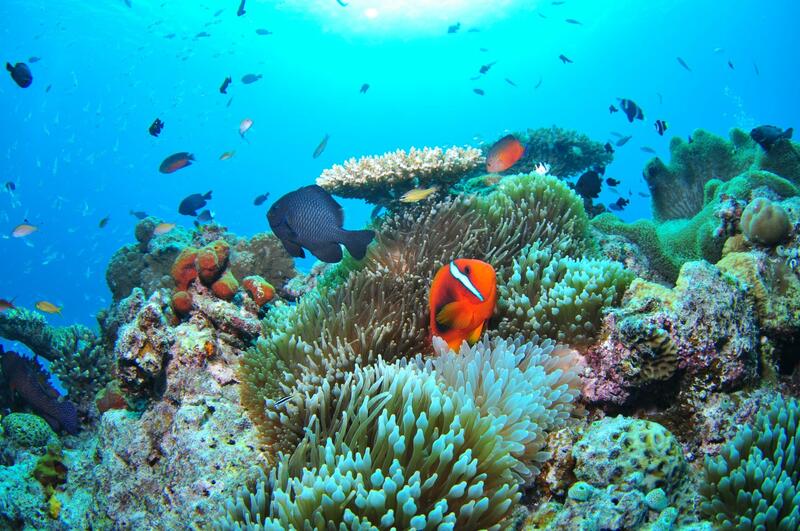 Shiroyone Senmaida faces the sea and is known as a famous place with a very sufficient scene. The scenery changes according to the season, it is a very attractive place. 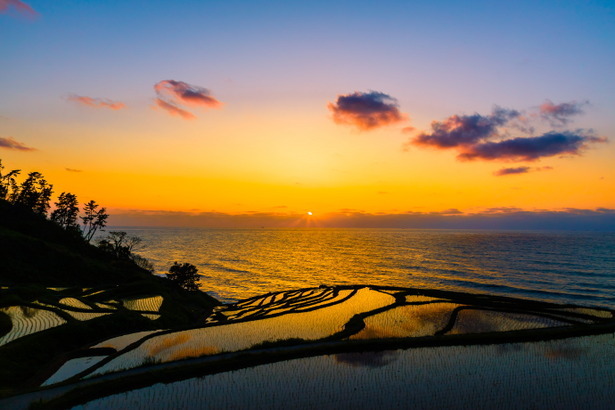 A beautiful sunset shines in the rice paddy with water in spring, and you can see the green rice shakes in the summer in the wind, the golden rice ear drooping head in autumn and in the winter a snow-covered rice field will appear. “Shiroyone Senmaida” is a sight that changes in appearance variously depending on time and season. 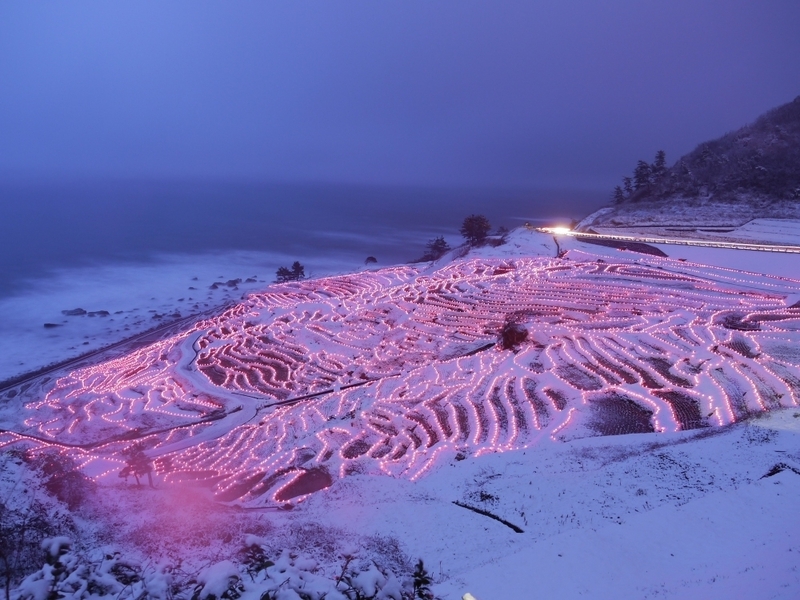 Shiroyone Senmaida carries out a large-scale light up every year. Approximately 2,100 LEDs are installed in the rice paddy’s entrance, entitled “Aze no Kirameki” (Sparkle of Levee), so you can enjoy the very fantastic rice paddy atmosphere of the evening. The landscape of Shiroyone Senmaida, which changes as the sun goes down, is very popular as a place to look different from daytime.